The most controversial decision rendered in 2009 will hopefully come to a resolution on May 8th. 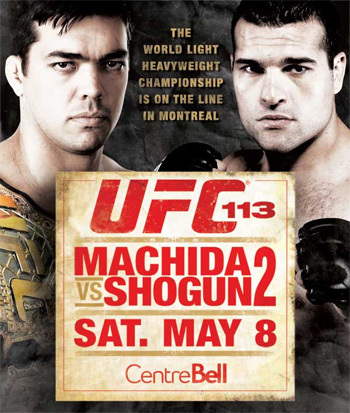 The event takes place inside the Bell Centre in Montreal, Canada and will be headlined by a light heavyweight rematch between Mauricio “Shogun” Rua and champion Lyoto “The Dragon” Machida. In addition, Josh Koscheck will face Paul Daley in a pivotal welterweight affair. It was reported yesterday that the victor will be assigned coaching duties on the 12th season of “The Ultimate Fighter” opposite champion Georges St-Pierre. In essence, the Kos and Daley scrap appears to be a 170-pound top contender bout.